A synergistic blend of herbs historically used as a natural decongestant for the sinuses. 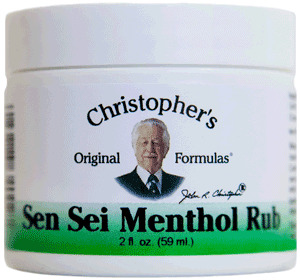 Dr. Christopher's Sen Sei Menthol Rub Ointment has been used traditionally to relieve tension headaches & sinus pressure. Available in 2 oz. & .25 oz. sizes.